Disclosure: I received these products complimentary but all thoughts and opinions are my own. This post contains affiliate links. The plate set from the collection comes with four different plastic, dinner-sized plates. This cute one with all the Disney summer icons, one with Mickey, one with Minnie, and one with Mickey and Minnie together! You can find the set here. To go along with it, there is also a fork, knife, and spoon utensil set for four with stripes and a Mickey for that touch of Disney magic! You can find them here. The pitcher and four cups come together as a set. It’s easy to store this cute summer set, since the cups stacked on top of each other fit inside the pitcher. I just love the 1970’s feel of this color palette, and that Donald and Pluto (two of my favorite characters) are included. You can find the set here. 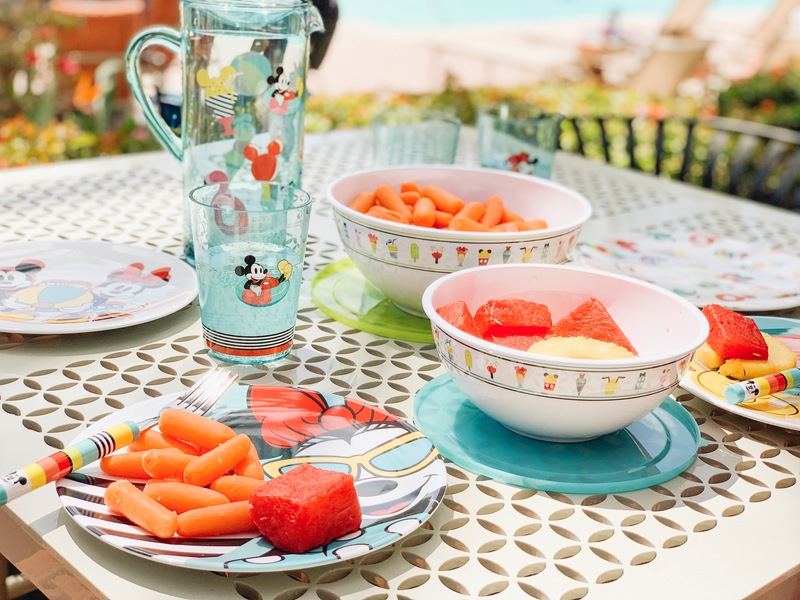 My favorite item from the Disney Eats Summer Collection is the set of 3 snack bowls. I love the cute ice cream character icons along the rim! The set of bowls are three different sizes, and taking food outside. I filled two of the bowls with baby carrots and fruit, placed the lid on and put in a cooler bag for easy transport! You can find the set here. Perfect poolside aesthetic with a Disney flair! You can take a look at what other items are part of the adorable Disney Eats Summer Collection on shopDisney!